Back again, sorry it took so long! This post’s a long one (aka we’ve been busy!). I hope these posts are worth it, because the amount of time it takes to keep this up is pretty insane! osu The osu!lazer project. The future of the osu! client. Download preview releases from here and follow along! While custom trails are not supported, the basic pieces of the cursor are now free to be customised. This was one of the highest priority skinning requests. With a quick press of F12 you can permanently save your memories to disk. 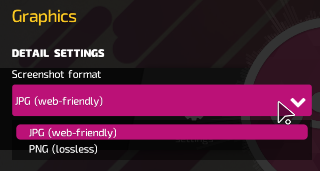 As with stable, you can also choose the format if you prefer lossless output. In recent builds, notifications don’t automatically pop-out. While this was less annoying, it also meant that notifications were basically invisible to the user (even when they were important). For now we’ve restored the behaviour of having the notification overlay pop out every time. You can dismiss it by clicking anywhere on the screen now, so it’s not near as annoying. Eventually we will have toast notifications which will appear without the need for the full notification overlay, so consider this a stop-gap solution. 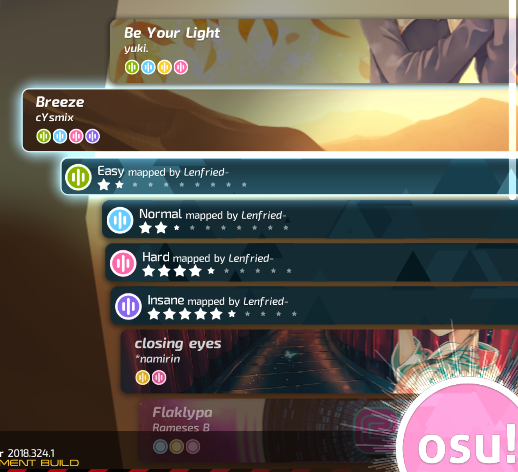 Beatmaps with custom skinned components will now get similar treatment to user skins. Going forward they will benefit from improvements to legacy skin support. I’d love to make a video showing this off but.. it happened to regress in the latest release, so that will have to wait ^^;. Note that for the time being, there is no toggle to disable this, so they will have priority over user skins. A toggle will be added soon. One component at a time, the editor is approaching a state where it could be considered usable. In theory, this would mean that hitobjects are now draggable in the editor. In practice, this regressed and isn’t working in the latest release, so let’s jsut pretend that it works for the time being. While the animation is still missing, you can now customise your judgement explosions visually. We now have accurate star difficulty calculations for three of four default game modes! All that remains is osu!catch (please someone help make it happen). After many of you reached out about the HP drain being insanely high, we’ve decided to reduce its effect to 50% until we decide on a final algorithm. Mmm, glowy! Still plenty of usability tweaks that need to be applied to the volume overlay, but at least it matches the surroundings now. Gradually the user profile section is getting more complete. This time we add the “Recent Activity” display. As you are already accustomed to, changes made on the visual settings panel are now conveyed in real-time. osu-framework The game framework behind osu!lazer. 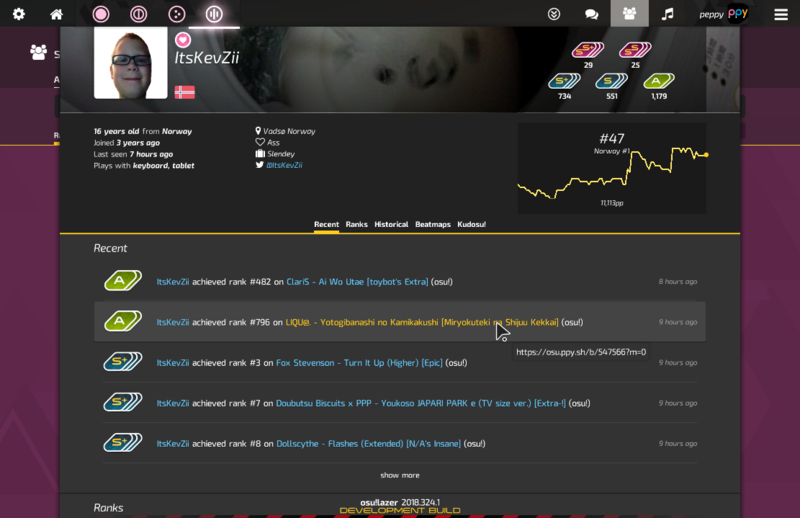 Written from scratch with osu! in mind, but very extensible. We have automatic logging of stutter frames to log files for further analysis. Unfortunately, the overhead from this being done on four threads can result in more stutters in a cascading effect. For now, this performance analysis is disabled by default and can be optionally enabled by the user when required. For what it’s worth, this same behaviour exists but only in CuttingEdge builds, to reduce the latency overhead for normal users. I undertook this complex task of ensuring frame-accurate rewind logic as the bugs surrounding transform rewindability were piling up. Things are in a very good state now, with the only remaining known issue being mostly unrelated to transforms themselves (approach circles get stuck on screen due to proxy drawables). This is a step towards getting the iOS build projects into the main development stream. Allows for more abstract window types to be the backing for game display. We’re still tackling a scenario where our unit tests get stuck in an endless loop state. This was another attempt to fix that. In the process, we managed to find a few memory leaks, although none of these will affect the end-user in any meaningful way as they only occur if you run multiple Game/GameHosts in a single execution. This is the framework prerequisite to get screenshot capture working at osu!’s end. osu-web The new web front-end. Already live but hasn’t yet replaced the old site, pending feature parity. 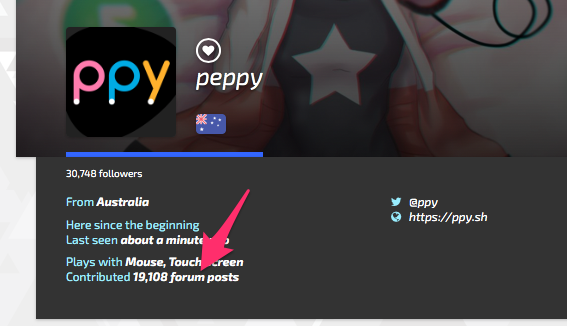 As we move closer to deprecating the old site, I wanted to make it easier for users to get a taste of the new site (but also get back to the old site if they find any lingering issues). As of today, the site will also remember your preference and ensure you remain on that version wherever possible. To allow for fairer qualification queues, we now allow up to 8 beatmaps to enter ranked from qualified each day per game-mode rather than being in a single global queue. Estimates shown on the new modding system have been updated respectively. 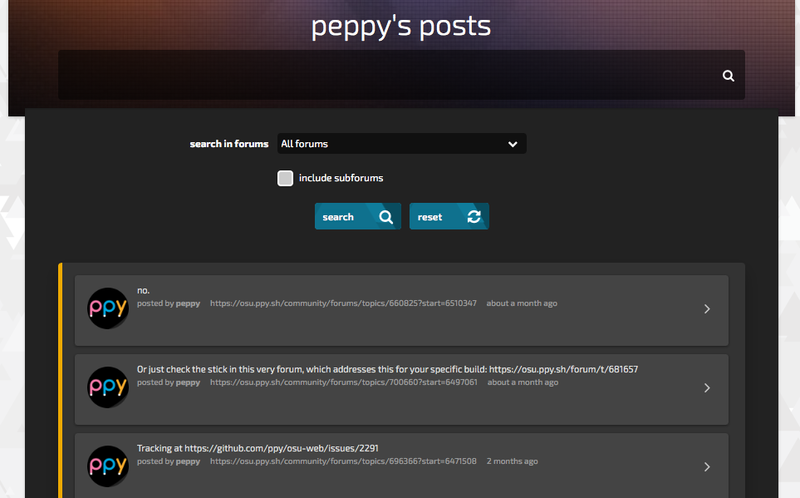 Due to popular demand, we prioritised getting post counts and user-specific post listings implemented sooner rather than later. 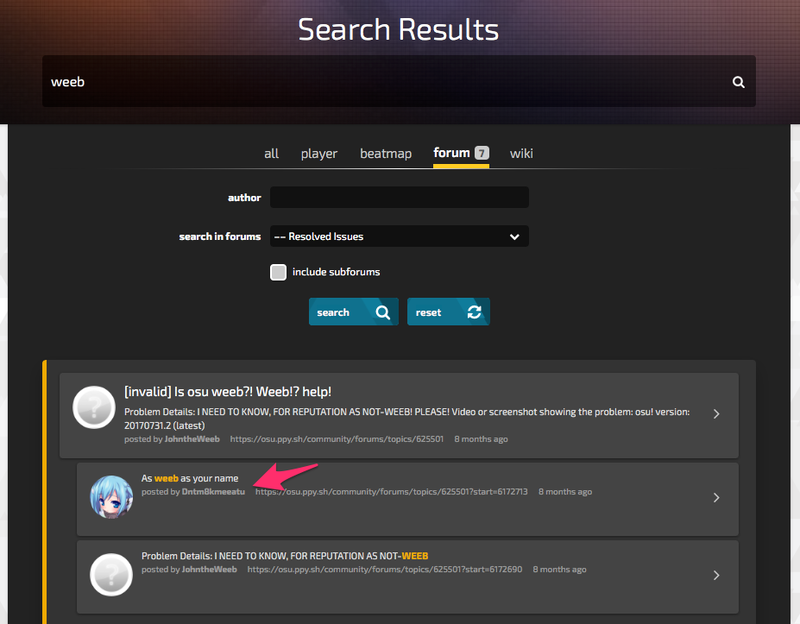 You can now choose whether you want to receive email notifications for your forum subscriptions. You can change this setting from a forum thread as you’re viewing it, too. Check the button on the bottom-left toolbar. 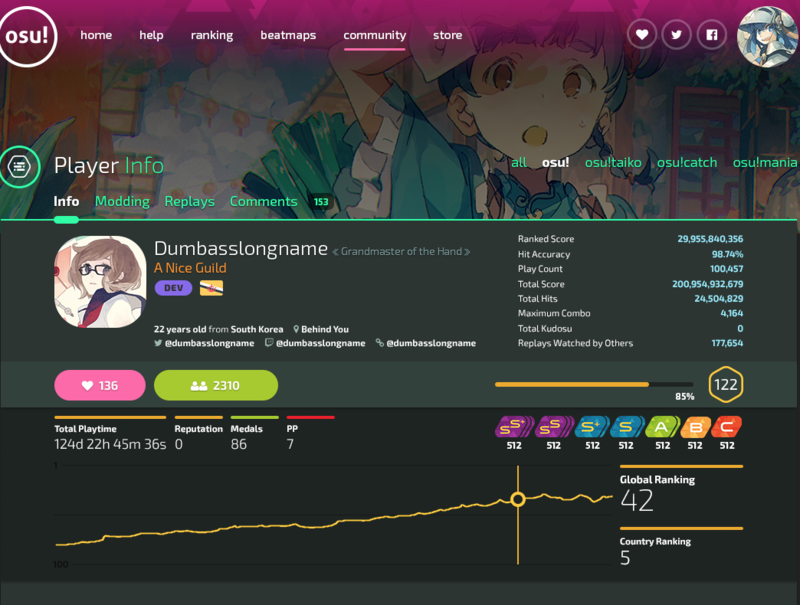 The ranking status of beatmaps are now displayed everywhere their panels are visible. Really neat UX improvement, in my opinion. You can now once again see what you did wrong if you’ve been a bad little Jimmy. We are listening to your concerns on decreased usability in certain areas of the new design (regularly people saying stuff is “too big” or “too spaced out”). You’re welcome to continue to voice your concerns, but just know that we do have some huge design changes in the pipeline which dial things back and make the whole site a lot more usable. 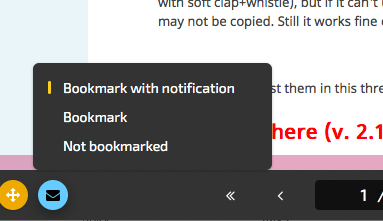 Except to see these changes hit before the old site is completely removed from existence. And don’t worry, we haven’t forgotten about profile badges (for tournament winners), the PM button or anything else that might feel missing at the moment. Bear with us for just a bit longer! Here’s a preview of the direction we’re going. I’m going to get in trouble for sharing this. Sorry flyte!